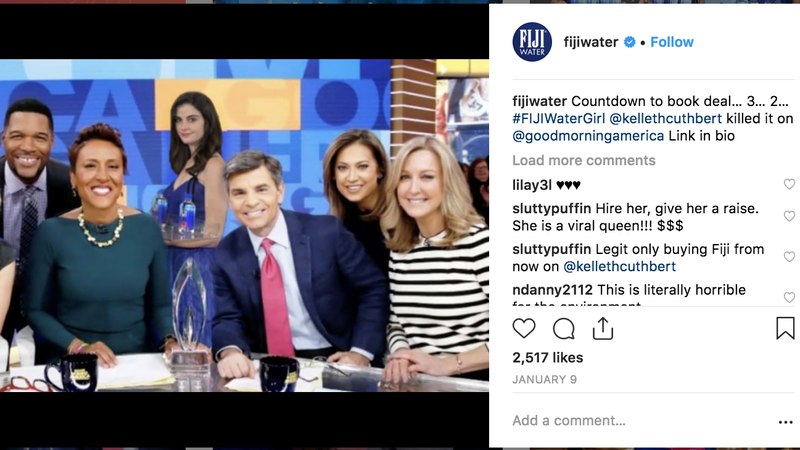 Fiji Water, a corporation known for its quirky viral marketing stunt, pretty bottles, and importing rich people’s water from a country battling deadly typhoid outbreaks because of its tainted water supply, is now countersuing their much-memed Golden Globes water girl. Kelleth Cuthbert (which is a stage name but also sounds like someone Niles Crane could be unhappily married to) recently sued Fiji for continuing to use her likeness without paying for it after her Golden Globes red carpet antics had concluded. That’s a fun coincidence, since the whole point of the Golden Globes photobombs was getting celebrities to unwittingly endorse Fiji Water. Deadline is reporting that Fiji says they paid her $90k for the marketing stunt and her likeness, but she upped the figure to $500k after the photobombs went viral. In the Fiji cross complaint filed Jan. 31, Fiji accused Cuthbert and her agents of “simple greed” in attempting to circumvent an agreement that she would serve as a brand ambassador and have her likeness used in advertising. Fiji claims the agreed-upon amount was $90,000, but Cuthbert sought $500k. “Fiji refused to pay this steep ransom,” the company said in court papers. “Simple greed,” says a company exporting overpriced water from a country where residents are often restricted to just four gallons a week per family and report frogs seeping from their pipes. Guess they’d be the authority on what simple, complex, and many other forms of greed look like. Kelleth Cuthbert contends that she never authorized her likeness, in the form of a cardboard cutout, to be displayed at a Bristol Farms grocery store in West Hollywood, California. In the interest of journalistic integrity, I should disclose that location as my neighborhood Bristol Farms, but I’m generally just shopping for wine and did not notice the cutout. Kelleth Cuthbert (I can’t stop myself from using the whole thing) also claims that Fiji duped her into signing a fake contract in a fake video declaring herself a Fake Ambassador of Water. Fiji is using the same video to prove that she legally agreed to become a Genuine Ambassador of Water. I’m team Jamie Lee Curtis in this because I vowed long ago to never contradict her, but Kelleth Cuthbert did a damn fine job, whether you agree with said job or not, and should be compensated for it.